MacLennan CrystalCoat is a waterproofing system that is applied to the surface of concrete to provide in-depth protection against the movement of moisture through the capillaries and hairline cracks within the concrete. CrystalCoat consists of Portland cement, specially treated quartz and a compound of active chemicals and is supplied in powdered form, it is either sprinkled onto fresh concrete or is mixed with water as a carrier and applied by means of brush or spray as a slurry for application to fully cured or older concrete or vertical surfaces. 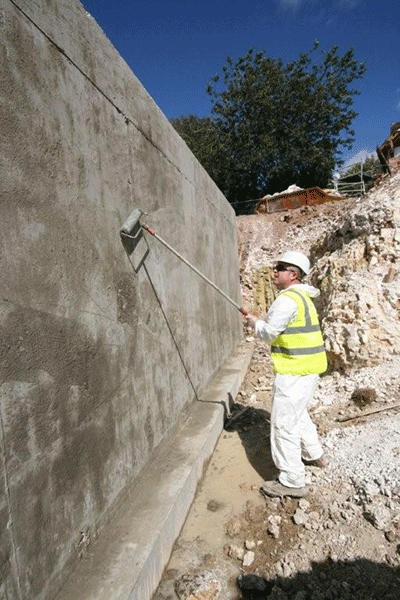 The active chemicals within MacLennan CrystalCoat combine with the free lime and moisture present within the capillaries to form insoluble crystalline complexes which effectively block the capillaries and any minor shrinkage cracks to prevent any further movement of moisture to provide a totally dry surface to the concrete. Large areas can be quickly treated with MacLennan CrystalCoat. 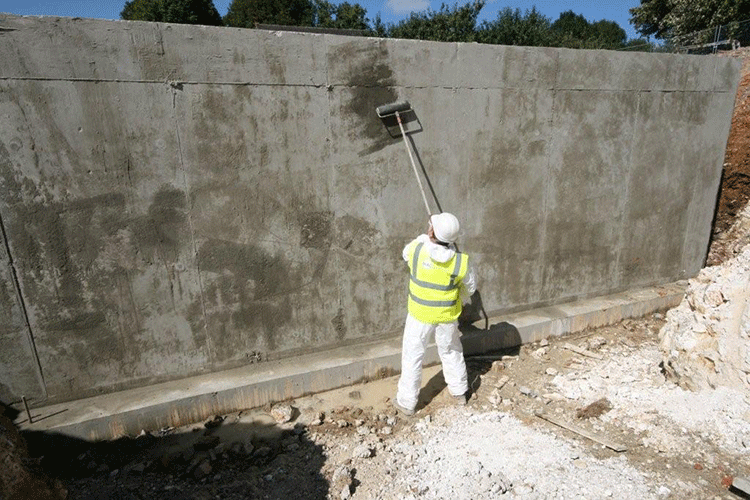 The speed of application and the low material application rate (1kg/m2) makes MacLennan CrystalCoat a very low cost option for a large number of scenarios where concrete waterproofing is required. Because MacLennan CrystalCoat penetrates deep into the concrete, it does not leave a physical membrane to the surface of the concrete element and so is completely unaffected by loadings imposed by further elements of the build. Ease of application – sprinkled onto new concrete and applied as a simple slurry to vertical and cured concrete. 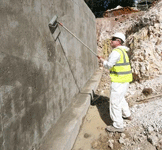 Permeates deep into the concrete to form a barrier against moisture that cannot be damaged or punctured. Loading capabilities only limited by the strength of the concrete. 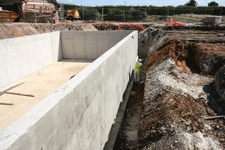 No physical membrane – subsequent concrete placement is ‘concrete to concrete’. Can be applied by airless spray for quicker application. Concrete treated with MacLennan CrystalCoat remains vapour permeable, allowing the structure to ‘breath’. 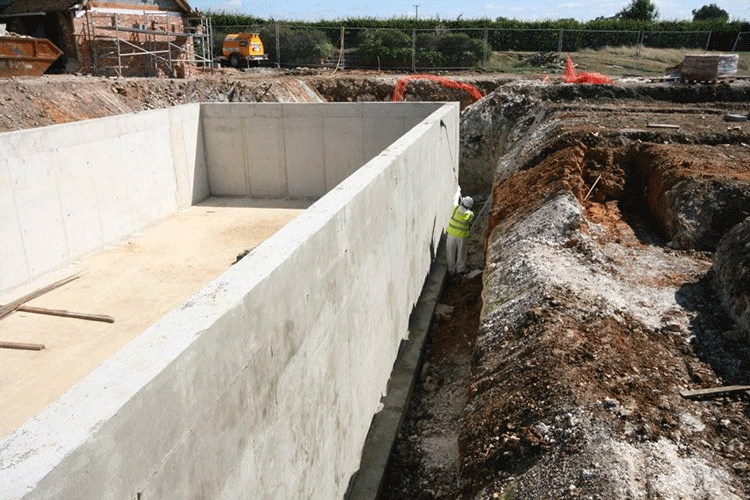 Easy to detail and specify as the concrete surface becomes the membrane. NOTE: MacLennan CrystalCoat is not a decorative material. When applied as a slurry, the slurry residue remains on the surface of the concrete and can be unsightly. Where applied as a dry powder to green concrete and trowelled or power floated, uneven colouring or blotching may be apparent once the concrete is cured. If a decorative finish is required, other products should be considered. Please speak with MacLennan for further advice.